For over a year now I've been baking all sorts of flatbreads, some great successes, some ended up glued to the ceiling with curses to make a Byelorussian lorry driver blush. 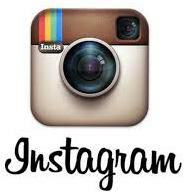 But I found one that is extremely simple to make and very reliable. You can do this for tea, to go with starters, with a curry or even just for breakfast. 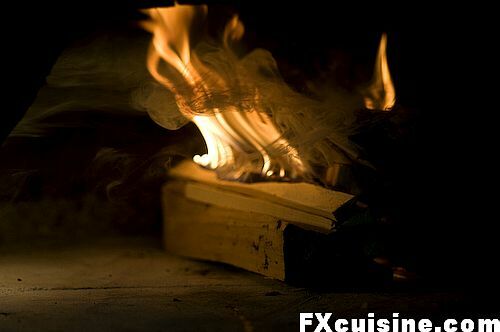 Unfortunately it does call for a seriously hot oven, the kind that is fired by wood. The story goes that when medieval French bakers had finished shaping their breads and watched them proving on the bench while the oven slowly reached its baking temperature, they would take little pieces of the remaining dough, stretch it roughly and throw it in the oven to test its temperature. Then they would eat these breads for their morning break. 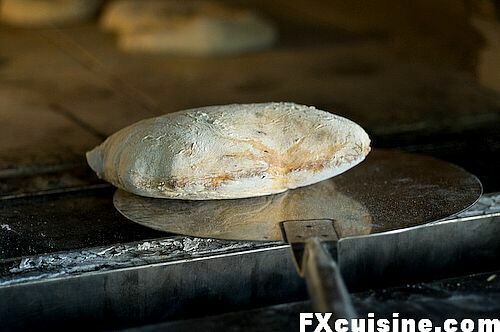 They called them fouées, from a root shared with other, different breads, such as fougasse or focaccia. But call this a foccaccia, or worse, a pita, and any self-respecting French baker will reach for his baking peel with fire in his eyes. 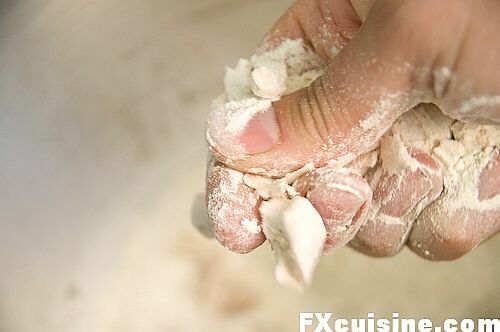 ... which you will crumble with a handful of flour like so. Very tactile, sensual and most cheffy. 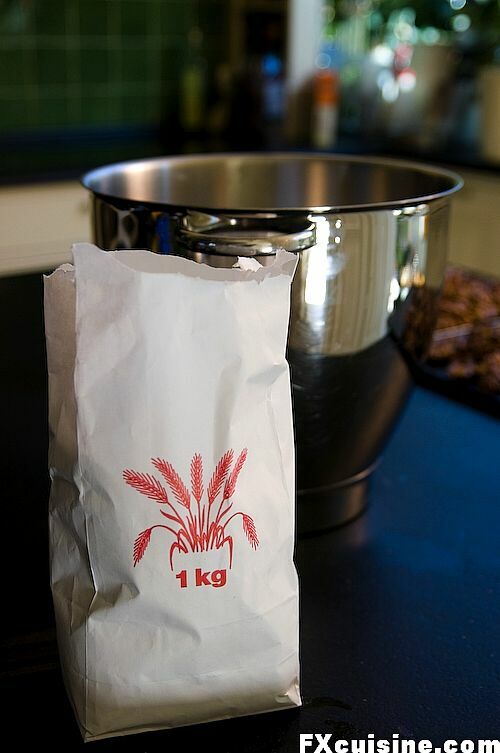 Add 15gr to 20gr of salt, then 700gr (7dl) of water. People who speak about bread like others compare baseball players of car specs will say that this is a "2-2-70 bread". 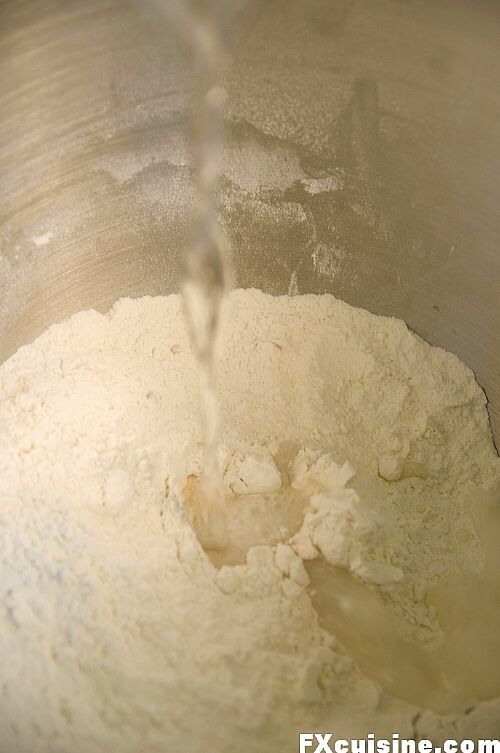 2% of salt, 2% yeast, 70% of water, expressed as percentage of the flour you use. Lots of scales can show a weight as a percentage of something you measured before, then press SET. 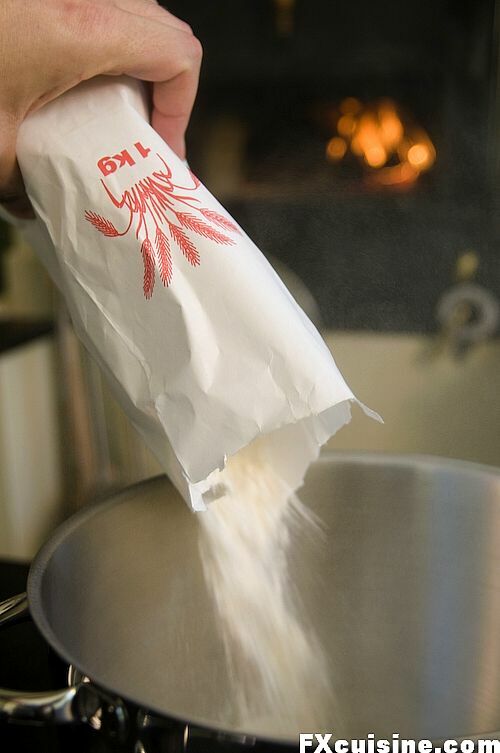 So I would dump some flour in the bowl, tell the balance to call this 100%, then add salt until it says 2%, and so on. 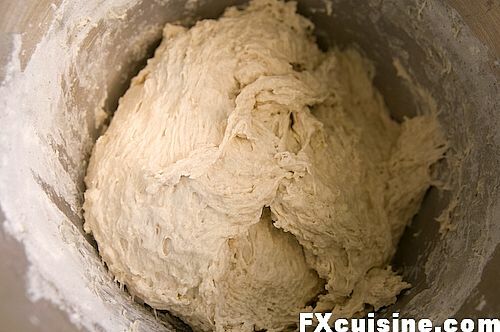 Mix, preferably with a dough hook or by hand if you must, until it makes like strands of gluten like here, about 5 minutes. Then leave it until it doubles. This is where I get asked the "how long" question. A fair question, but the answer is invariably "it depends". Let me explain. 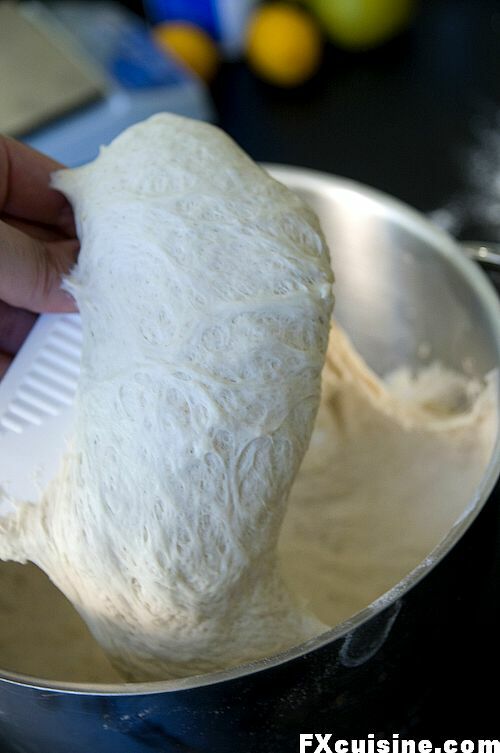 On a cold winter day, using cold water, it may take 3 or 4 hours for the dough to double. But on a hot summer day, with lukewarm water, within one hour the dough will start going over. 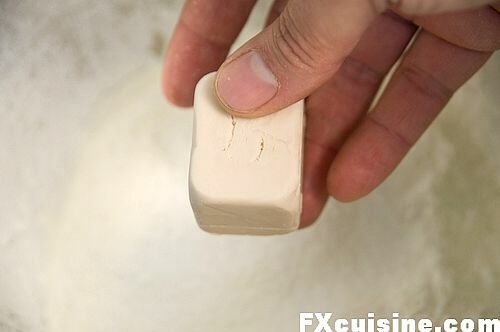 This is not a problem - all you need to do is accept this biological process of the yeast cells multiplying faster when it's warmer, and after a couple times you've baked bread you'll anticipate. Oh it's a warm day and I can't bake before noon - then use ice cold water and if it goes too fast, put the dough in the fridge. Or "oh good Lord I'm late the guests will be around in an hour" - use warmish water and keep the dough in a warm place. Obviously this is only the very basics of breadmaking and longer rise, overnight in the fridge with ice-cold water, will yield more interesting flavors. 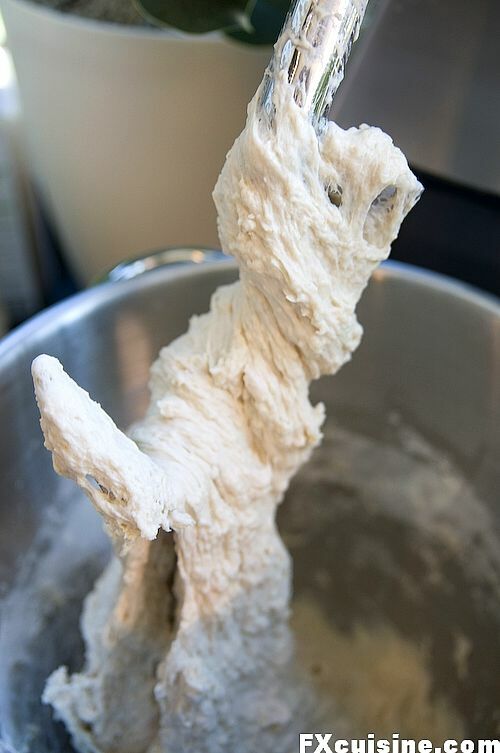 But you have a lifetime of breadmaking before you so let's start on making this simple, fun and delicious bread. Don't miss the pictures of the actual baking on the next page!